Our CertBlaster® test prep software is AWESOME! Exactly how awesome you may ask? 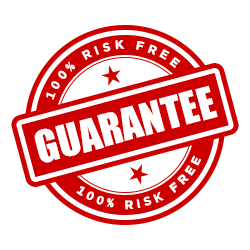 Well, awesome enough that we offer an exceptional 6-months First Try Guarantee on all our CertBlaster® practice tests. ALL of them! If for some inexplicable reason you would fail, then we’ll give you a full, no-hassle refund. That’s how confident we are that CertBlaster® will get you ready. How come CertBlaster can do it? With over ten years of experience and exceptional outcomes CertBlaster® has the track record. Over a million users have so far benefitted from CertBlaster. Beacuse CertBlaster provides personalized feedback and remediation it enables you a laser focus that gives exceptional results. When you take that with the sheer numbers of questions available and the 100% realistic certification simulations, it’s no wonder you get exceptional outcomes. That’s why we are so confident that CertBlaster® will get you ready. Below see our test structure. Using A+ 220-801 (Hardware) as an example of CertBlaster test structure you can see here the two types of tests. On top are Exams 1 – 4. 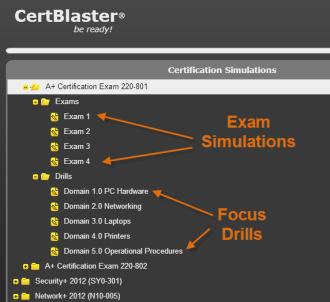 These are the full exam simulations. The default timer is set to 90 minutes for 90 questions just as on the actual certification exam. Below the exams, the five focus drills each targets exclusively one main domain or exam objective as defined by CompTIA. The largest one is PC Hardware because at 40% that is the one weighted the heaviest on CompTIA’s objectives list. Our PC Hardware drill in and by itself has 190 questions! The CertBlaster trademark, CertBlaster content and CertBlaster website are owned by dti Publishing Corp. dti Publishing specializes in technology enhanced learning and develops interactive learning platforms, virtual labs, content retention testing as well as full fledged online classes. For all our solutions be it CertBlaster, LabConnection, ExamConnection or IT_LabWorks, the outcome is always the same: We help learners learn faster and better.